Habitat for Humanity Choptank turns funds from the Maryland Energy Administration’s EmPOWER Clean Energy Communities Low-to-Moderate Income Grant Program into affordable, energy efficient home ownership opportunities on Maryland’s Eastern Shore. Like other Habitat affiliates around the United States, Habitat Choptank, which serves Dorchester and Talbot Counties, is well known for building affordable homes using mostly volunteer labor. These homes are sold to qualifying low-income families with a zero-interest Habitat mortgage. Over the last five years, Habitat Choptank’s homes have gone “green” –incorporating building techniques that reduce energy and material usage, lessen the impact of construction on the environment, and save the homeowner money in the long term operation of the home. EmPOWER funding has contributed to the construction of 14 energy efficient homes in Habitat Choptank’s service area. Grant funds have been used to not only make tremendous building improvements, but also make upgrades to higher efficiency equipment like heat pumps and hybrid water heaters. Habitat Choptank also uses many low or no cost energy saving strategies to keep green building affordable. These include orientation for passive solar, sizing overhangs to provide summer window shade, utilizing value engineered framing techniques to minimize thermal bridging, conditioning crawl spaces and installing HVAC systems in conditioned space. 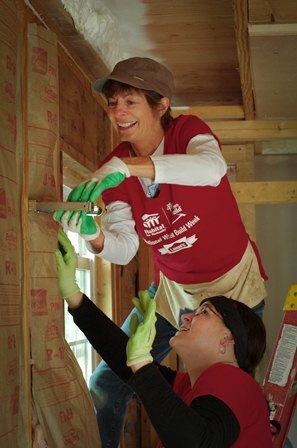 In addition, Habitat Choptank participates in Habitat for Humanity International’s Gift In Kind program. Whirlpool provides Energy Star refrigerators to all Habitat for Humanity homeowners in the United States; DOW donates Weathermate house wrap, and rigid foam board for crawlspace insulation. To verify savings, an energy efficiency rating is completed on all newly constructed homes. In most cases, the savings total is over $500 per year, often as much as one month’s mortgage principal payment. The utility savings combined with the savings achieved through Habitat’s zero interest mortgage create a transformative opportunity for hard working, low-income families. “Owning my own home means I’m in a decent place with a better life. My bills – including my mortgage – are less expensive. When I rented, the winters were hard. Sometimes I paid as much in utilities as in rent. I spent summers trying to catch up,” said Rowena Potter, Habitat Home Owner. EmPOWER funds help make going green easy for low income home buyers. These homes are affordable in both purchase price and in long term operating costs The attention to building energy efficient homes further promotes transformation for Habitat’s low-income home buyers and for neighborhoods. Homeowners, who have affordable housing costs, including their monthly mortgage and utility costs, are more able to invest in the long-term maintenance of their homes and to have money left over at the end of the month to build savings and to spend in the local economy.